Keenan Komeiji's dreams of catching a monster ulua came true on July 8, 2014 while fishing the Ka'u coast on the Big Island. Keenan battled his 110.9-lb behemoth using an 12' 6" IRW Big Island Special pole mated to a Shimano Trinidad reel filled with 80-lb test Suffix line. 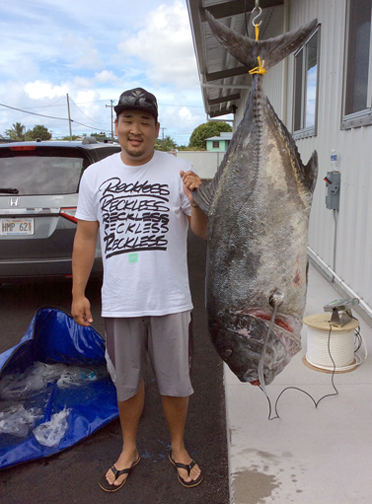 After landing the ulua, Keenan took it to S. Tokunaga Store to weigh it on their certified scales.